Chat with author Ronald Damien Malfi on Monday, July 31st at 10pm EST. 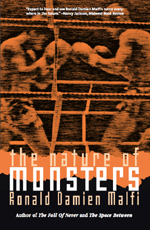 He’s the guy that wrote The Nature of Monsters, avaliable for pre-orders now from 5SW. Help get the word out. This is the official press release. (600 KB PDF.) Feel free to print this out and hand it to your favorite independent bookstore purchasing coordinator, university or county library, or big-chain bookstore information desk. Also, set your alarm clocks for the chat. Hop on and bug Malfi about what it’s like to be a professional like honest-to-God-paid-for-it author and how well we at 5SW have taken care of him so far. There’s your assignment. Get to work. I’m guessing there are those of you who are curious, maybe, to know what has been absorbing my time over the past year or so. Because since a little over a year ago, posts and comments and, well, signs of life in general have been … sparse. I haven’t been completely incommunicado with everyone, but I did pull back plenty — to regroup, to buckle down, to concentrate, to find out where things were headed. Last year, around the beginning of March, my day-job became unlivable. Things that I had been told were to happen when I signed on two years prior failed to resolve themselves, and, in fact, started to move backwards. I’m not one for moving hopelessly backwards. After deciding to go forward on at least one front, I focused on writing. A publisher picked up my novel and invited me to participate in an anthology. I wrote somewhat shy of bunches and bunches, but what I did write was much more solid. Socially, I pretty much withdrew from everyone except the woman I married this past March. I rejoined the functioning (i.e., paying) workforce a few months beforehand and have been steadily improving my situation since then. March also saw the release of said novel, and a couple more people have invited me to write for/with them…. But I’m a bit ahead of myself. Last July 1st saw the paperwork signed for the incorporation of 5 Story Walkup, LLC. It’s a publishing house. Adam P. Knave and I are co-owners. We invited no investors — no outside funding of any kind — and obtained a manuscript of exceptional quality from Ronald Damien Malfi. Malfi had published a couple of novels already in the horror genre, but the manuscript he gave us was pure literature. Like, Fitzgerald and Hemingway literature. No wonder no other publisher wanted to touch it. You can ruin your name associating with that stuff. 5 Story Walkup doesn’t care about genres or literature. 5SW publishes stories. Strong stories. Knave and I worked to get the money and paperwork in order so that the publishing wouldn’t be an ideal, but a reality. We fought against a very strong counterflow of negative advice. We bribed editors and typesetters with investments in beer futures. Milestones were passed with alarming regularity. It’s a lot easier than it seems if you don’t mind working. Anyway, Malfi’s new book is an amazing read. It makes it easier to work hard when you know the story deserves it. For instance, I read the entirety of the manuscript within ten hours of it arriving in my email inbox. I read the entire thing onscreen. That’s an act of love, people. Manuscript has been received, read, had an advance paid for it, tweaked, edited, early copies printed for reviewers, had marketing planned for it, edited some more, sent to a printing/fulfillment house, had a cover designed, and everything. ISBNs, Library of Congress numbers, Books In Print registrations, press releases written, everything. Reviewers located and pelted with advance copies. Radio station contacts obtained for badgering for interviews. Bios, copyright credits, disclaimers, boilerplate, all the fine print…. Done. That’s the first half of the job. The second half is selling it. That won’t be hard. Your children will be forced to read this book in college. So where have I been for the past year? Working. Writing — that’s one job. Publishing — that’s another. Wrangling IT for a small family-owned business that’s just gone corporate across three time zones — that’s a third. Good thing I managed to get three whole weeks with my woman last November/December — in Hawaii, no less, thanks to a radio call-in contest — because we don’t see to much of each other lately. Three jobs, only one paycheck. So far. TwoHeadedCat, the writing experiment that Adam set up to hone the skills and launch the careers of those who were serious about writing, is drawing to a conclusion this September. I will have nearly a hundred and thirty articles archived there when the doors close. At somewhere around a thousand words apiece, that’s a lot of honing. It’s amazing there’s any knife left. Regardless, I’ll probably still want a regular nonfiction outlet somewhere, so now’s probably the time I should start looking…. As money comes in for Malfi’s ouvre, we’ll start shopping for our second and third manuscripts for 5 Story Walkup to publish. I’ve got a small backlog of short pieces looking for homes, fiction and non, and novels I’ve been neglecting. There’s the literary journal I’ve been wanting to front for almost two years now, and it’s not off the radar. In fact, it’s closer than ever. And I suppose this day-job thing will want me to keep showing up and spinning straw into copper. And I might as well hunt through the 2HC archives and see if there’s anything in there worth compiling, rewriting, refining, and possibly putting back out onto the market. I’ve been practicing reading some of my stuff aloud for potential audio/podcast release, and I’m told I could probably pull it off…. Robert Crofton, a socially inept and naïve young farm-boy, arrives in Baltimore to write his first novel and to reacquaint himself with an old hometown friend: poet-turned-prizefighter Rory Van Holt. In an effort to resume their peculiar and mysterious friendship, Robert Crofton abruptly ensconces himself in Rory Van Holt’s circle of friends. Robert soon finds himself sinking deeper and deeper into the quagmire that is their lifestyle. They are corrupt and privileged socialites, damaged by extraordinary wealth, gluttony, greed, arrogance, and power. Dreamlike the characters float in and out of Robert’s life with inebriated casualness while Robert’s innocence invites these characters to subtly abuse and ridicule him while also accepting him, for the purpose of their own relief against monotony, into their monstrous society.